Wood, Paper & Paperboard Recycling Market size was over USD 21 billion in 2017 and will grow at a CAGR over 4% over the projected period. Wood recycling is a process which involves the collection of waste wood generated by various end-users, and are recycled for further use in other applications such as wood panel manufacturing, animal bedding, energy generation, etc. The demand for wood recycling is increasing significantly due to the rising efforts to reduce tree cutting for making fresh wood. Despite many efforts to effective wood recycling, there is still a substantial volume that ends up in landfills every year. This process is environmentally unsustainable and expensive. The global demand for timber is increasing on a rapid scale, and this has led to increased wood production for various end-user applications. According to FAO of the U.S., the industrial roundwood production was over 1,750 million m3 in 2012, and increased to 1,874 million m3 in 2016, at a CAGR close to 2.0%. Due to this rising demand, the need for wood recycling is also predicted to grow at a moderate scale over the coming years. Additionally, wood recycling also reduces the impact of green house gases, which will substantially benefit the environment, which will in turn enhance the wood recycling market over the coming years. In recent years, the demand for recycled wood has increased to various applications, including wood panel production, energy generation, animal and poultry bedding, and other applications such as equine surfaces, and landscaping products. Recycled wood offers low moisture content than fresh wood, which will create more durability. The recycled wood will also have more strength, compared to fresh wood, hence suitable for the manufacture of wood panels. Paper recycling became a key trend in the global paper industry, majorly due to the scarcity of raw materials like wood pulp. Recycled paper has become the major source of raw material for many paper mills in both developed, and as well as developing countries. Paper recycling saves natural resources and reduces manufacturing expenses. Around 30% of the raw material demand for paper in countries including India and China are primarily met by recycled paper. In developing countries such as India, a lot of import of recycled paper is happening to meet the domestic demand, mainly due to lack of proper segregation and collection channels for waste paper. Moreover, the rising demand for paper-based product packaging for food & beverage will rise in the future years. Growing urbanization, coupled with increasing middle-class population with a huge rise in literacy rates in developing economies like India, China, and Brazil will accelerate the rising demand for paper & paperboard products. Moreover, shifting consumer requirements towards packaging solutions which are convenient, along with increasing opposition to plastic packaging will significantly push the global paper & paperboard recycling market over the coming years. Moreover, growing concern towards the negative environmental effects of polymer packaging will create an additional demand for paper and paperboard packaging, which further increases the recycling rates over the coming years. Lack of proper collection, segregation, and recycling facilities in countries such as India, China, Italy, Spain, and others is one of the major factor opposing the growth of wood, paper & paperboard recycling market from the past few years. Moreover, high costs involved in the recycling of used paper further restrain the global market size. In terms of grade, wood recycling market has been segmented into grades A, B, & C. Grade B wood finds applications majorly in manufacturing, in different coated forms. The demand for grade B wood was more than USD 1,200 million in 2017 and is expected to increase at a CAGR more than 4%, towards the end of the forecast period. This is majorly due to the rising consumption of material-coated wood in manufacturing companies. 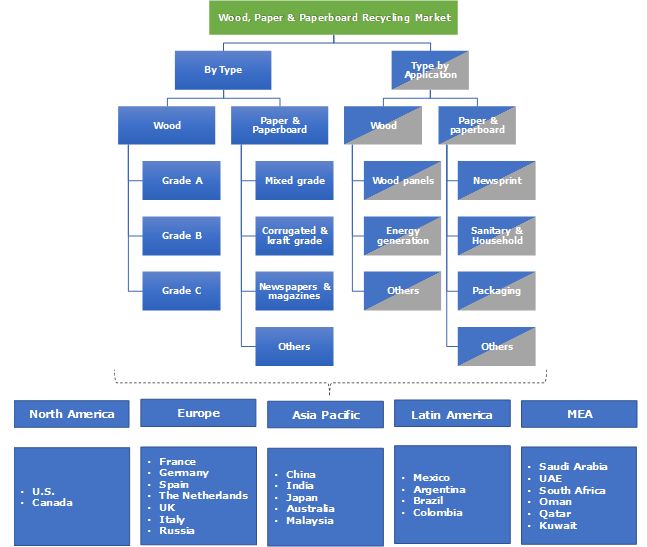 In terms of grade, paper & paperboard recycling market has been segmented into mixed grade, corrugated & kraft grade, newspapers & magazines, others, which include printed papers, calendared papers, coated & uncoated fine papers, writing papers, other packaging papers. Newspapers & magazines had the largest market size of over USD 9,300 million in 2017 and will grow at a moderate growth rate till the end of 2025. This is primarily due to the increasing demand for printed newspapers & magazines in both developing & developed economies. In terms of growth rate, corrugated & kraft grade is expected to have the fastest growth rate till 2025. In terms of application, the global wood recycling market has been segmented into wood panels, energy generation, and others which include landscaping products, animal bedding, furniture, pulp, coal making, etc. The demand of recycled wood for wood panel manufacturing had the highest market size of over USD 1,200 million in 2017. Increasing demand for plywood globally, is increasing the overall demand for recycled wood into wood panel manufacturing. 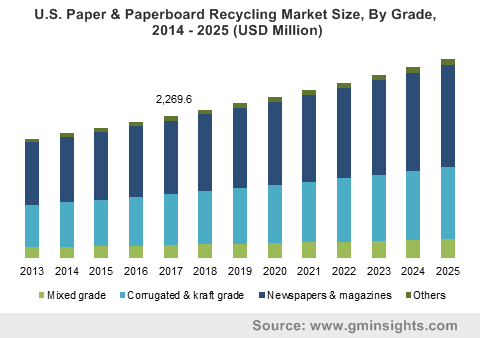 In terms of application, the paper & paperboard recycling market has been segmented into newsprint, sanitary & household, packaging, and others, which include container boards, white lined chipboard, solid bleached board, solid unbleached boards, etc. The paper & paperboard recycling market for newsprint had majority share of the overall market, surpassing USD 3,600 million in 2017. This is majorly due to the rising demand for magazines and printed papers across the globe. Asia Pacific wood, paper & paperboard recycling market held the largest share of the global market in 2017. This regional market surpassed USD 11 billion in 2017 and will grow at a fastest CAGR till the end of the forecast period. Rising demand for paper products in the economies such as India and China will have a huge positive impact on the growth of Asia Pacific paper, paperboard & wood recycling market. North America paper, paperboard & wood recycling market was over USD 3 billion in 2017 and will grow at a sluggish growth rate till 2025. This is majorly due to the market saturation in developed countries like U.S. The paper & paperboard recycling technology was highly adopted in this region over the past few decades. This region has also gradually increased its paper and wood recycling rates over the past few years. The global paper, paperboard & wood recycling market is highly fragmented. Some of the renowned players in this market are American Paper Recycling Corp., Carolina Fibre Corporation, Evergreen Paper Recycling, Global Waste Recyclers Ltd, Hadfield Wood Recyclers, Hanna Paper Recycling, and Huron Paper Stock among others. The players in this market are continuously striving towards improving their recycling capacities constantly, from the past few years. Due to the rising environmental concerns, and reducing resources, the need for recycling of all kinds of products is increasing at a swift growth rate from the past few years. Several recycling companies have been established. These companies cannot treat all kinds of wastes generated by the manufacturing companies. As per regulations, these companies cannot treat hazardous wood wastes., and those wastes must be landfilled only. Four grades of waste wood are available in the market, namely grades A, B, C, and D. But, we have considered only three grades of waste wood (A, B, and C), as grade D is hazardous, and can only be landfilled, but not recycled.